My first instinct was finding a mate, with whom to travel. I’ve always travelled along with friends so far, and I wasn’t so eager to consider other options. Unsuccessful, I decided to gather all my courage and depart on my own. It would have been such a waste not to take this marvelous prize. By the way, travelling alone can be tough, so I decided to set my route in order to pay a visit to my friends in France, Belgium and Germany, and to test my luck, again, by looking for good company along the way. Thanks to the Erasmus project I had the chance to become friends with many students all over Europe, and it turned out to be useful in this kind of occasion. Due to my university and work commitments, I decided to start my adventure in October. Yes, I know, October can be pretty cold in middle/northern Europe. But as they say, “There’s no such thing as bad weather, only unsuitable clothing”. Once my backpack was done with all my equipment, I was ready to reach Milan. The city is close to the Italian northern border. That, along with the presence of a friend of mine willing to have me to be his guest, made it a perfect base for my departure on the next day. My first stop was in Strasbourg: a long journey passing through Switzerland, where I had to switch trains in Basel. The Swiss public service is very efficient, and my train was comfortable enough to rest on the way. This last feature is literally fundamental during an Interrail trip. 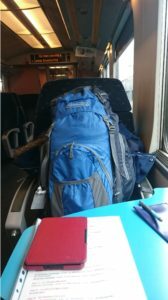 Travelling between different countries takes time, and the nature of the Interrail itself requires you to be always mentally and physically ready. Some change might occur in the timetable due to a delay or yu might have to walk for some miles to reach your hostel from the train station. Generally speaking, you always need to be ready to adapt to the situation, this is why it is so important to have the chance to rest and recharge your batteries during train time. In Strasbourg I was welcomed by a grey sky, covered by menacing clouds. Good news was that at least, once I left Italy, I always found dry weather, which makes it easier to cope with the increasing cold. My friend Emma was there to pick me up. She’s was my host and guide for two days in “the French land”. The city is a delightful mash up between French and German architecture. It is placed in Alsace, a region that has been contended by the two countries for several centuries. I enjoyed wandering through the alleys, walking along the colourful riverside and taste the local food, especially the saucisson. Yes, I must admit the food was particular and enjoyable. 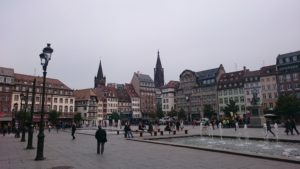 Strasbourg is a university city, full of life and active young people. We took part in a pub crawl at night, and I reunited with my Erasmus friends Claire, Lucille and Sarah. Interrail is a frenetic adventure, and just a few hours later I was about to depart for Brussels. They say “it’s all about the journey, not the destination”, and with Interrail it is definitely true. I love travelling by train: the inner side of the country you are visiting shows itself, allowing you to have a better idea of the landscape and real life outside cities. Even more important is that it grants you the possibility to visit places you’d otherwise never consider to journey to. A clear example would be: on the way to Brussels, I paid a stop in Luxembourg. Now, with all due respect, how likely are you to plan your next holidays in Luxembourg? Not much. Luxembourg is a pretty small nation, and it takes just a few hours to visit Luxembourg’s main city. Home of European institutions, the city is also home of an ancient fortress dug in stone, the Bock Casemates. I was happy I took some time to discover this unexpectedly wonderful place. Interrail has the advantage to make you discover places not usually on the list of main touristic attractions, but that are definitely worth a visit. A few hours later I safely arrived in Brussels, the Belgian capital and home of, as well as Strasbourg and Luxembourg, the main European institutions. The basic structure of my travel plan was to arrive in a main city late in the evening, reach a previously booked hostel room, decide what to visit on the next day and then get some well-deserved rest. A meticulous daily preparation was fundamental for me. When I started this adventure I decided to visit as many places as possible, in a limited time. Assuming this, it is easy to guess that I was often rushing in order to see every present attraction and monument. In this context, a good organisation turned out to be essential. 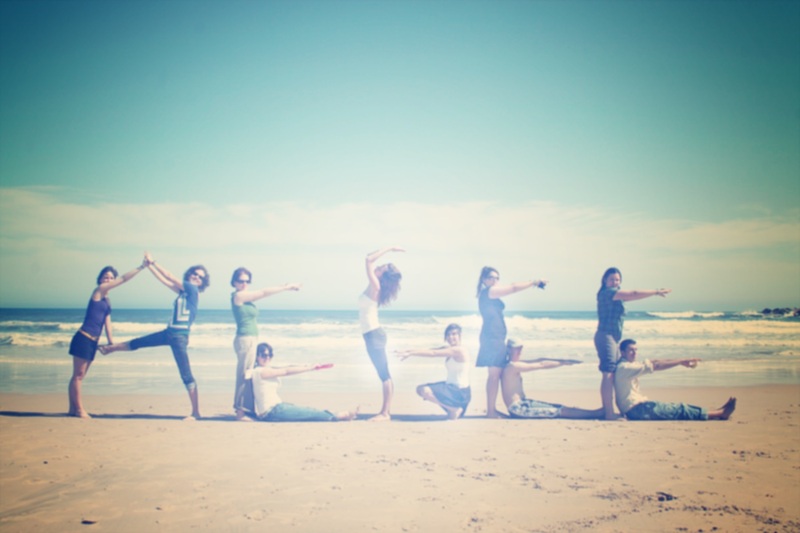 At the same time, it is also important to enjoy life, relax and make exceptions to the plan. And, I must say, for Belgian beer I really had to divert from my plan. My next main stop was in Amsterdam. It took me a couple of days to get there, because on the way I spent some time visiting Antwerp, Rotterdam and Utrecht. Three cities for three different kind of allure. An old busy port city, a super modern harbour and an ancient inner town crossed by canals and well-guarded by the famous Dom Tower. Besides, still drawing from this segment of the route, a special mention goes to Zaanse Schans, a little community of forty houses and few windmills. The place survives in old fashion way, fueled by artisan activities and tourism. 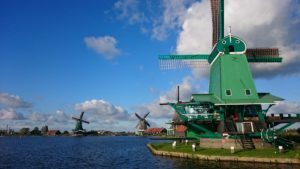 It is possible to enter the windmills, attend the preparation of the local cheese, Gouda, and taste a freshly ground hot chocolate sitting on the riverside. A small, lovely, corner of old Holland where I left a piece of my heart. I loved the Netherlands, and after an intense visit of the country I was ready to face the longest test of this journey: a 12 hours race to Copenhagen. Not an exciting prospect, but if I learned something in this period is that no trip is too long when you have your books and your music. Despite my excellent timetable, I lost the connection in Hamburg and started panicking. It was a moment of chaos because in Germany signs and announcements are only in German and I managed to solve the problem only with the help of the information desk. Copenhagen was still far away and at the moment it was hard to set a new route. Fortunately they were so kind to allow me to catch a direct train that wasn’t provided by my pass (and I didn’t have to spend a sent more). They omitted to say that this particular train was going to follow a different track, heading toward Fehmarn to board on a ferry directed to Denmark. Just for a moment I thought we were going to head down in a tunnel I never heard about. Didn’t I mention it at the beginning? Be ready to adapt! The city of Copenhagen was unbelievable. Worth a visit, efficient under every aspect, and with a Nordic charm. During my staying in a hostel I had the opportunity to interact with local and foreign people, sharing stories about our journeys and learning tips about underground party places. During the visit of a city, I never waste the occasion to get to the local market. I consider it a good display of traditions and an opportunity to talk with local people. Eventually, I stepped into the last part of my journey on the way home. 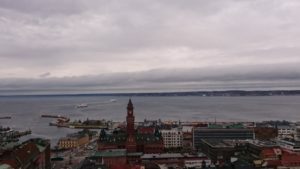 A brief visit to Sweden and then down toward Germany. Once crossed the Øresund bridge and after climbing the fortress of Helsingborg, I reached Malmö. Malmö is a port city, with not much to offer to a visitor. To avoid the struggle of passing by Denmark again by train, I decided to take a ferry at night towards Lübeck. Guiltily, I didn’t consider that the port was 6 miles away from the train station, not the walk you would gladly make. Not at night, not with a 15 kilos backpack. Just another day at the office. Interrail teaches you that Google Maps can really be your best friend. Once arrived in Germany, not without struggling, getting home to Italy was a matter of a few days. But yet I had the opportunity to visit Lübeck, Dresden and Leipzig, three astonishing cities. Passing by Switzerland once again, hands down my favourite landscapes, after about two weeks I was again in Milan, tired but extremely happy. It’s been an adventure that tested and changed me in ways I didn’t expect. An intense experience that I’d strongly recommend to anyone who wants to see Europe.